Here’s what’s up in the world of TV for Tuesday, September 27. All times are Eastern. Frontline (PBS, 9 p.m.): If we’re wrapping up our What’s On Tonight tenure—more on that in a moment—then there’s no damn way we’re not making Frontline the top pick. That’s just what we do. Thankfully, Frontline is actually airing a new episode tonight, saving us from the awkwardness of making the top pick a show that isn’t actually, you know, airing. 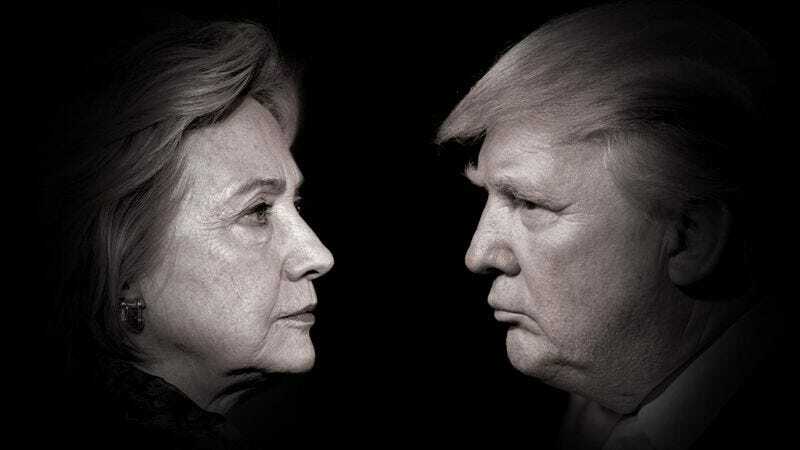 And this should be an intriguing and/or maddening one, as Frontline has two whole hours to explore this election, profile Hillary Clinton and Donald Trump, and try to bring some actual insight to what has generally been some pretty awful media coverage of a pretty awful election. Hey, if anyone can do it, it’s Frontline. Mad Max: Fury Road/World Cup Of Hockey: Finals Game One (MovieMax, 9 p.m./ESPN, 8 p.m.) Remember when What’s On Tonight used to throw movie and sports recommendations in the listings? Sure, a nostalgia trip feels a little hard to justify here, given it was only a few months back that we even made the format change, but what the hell! Fury Road is an absolutely incredible movie that admittedly maybe loses a little something in the jump down from theater to TV, while the World Cup of Hockey has been a total blast for everyone except the droopy Team USA, which got bounced in the qualifying round. WWE SmackDown Live (USA, 8 p.m.): Avid readers of the Tuesday What’s On Tonight will recall that our attempt to demand a new contract last week backfired spectacularly, and now our WOT-writing career is over if we lose a match against the Undertaker—or, to use his non-wrestling name, fellow TV Clubber Dan Caffrey. Meanwhile, SmackDown reviewer LaToya Ferguson has been watching this show long enough to know that going one-on-one with the Phenom doesn’t generally end well, but we’re feeling good about this. Let’s get this started! Oh. Oh dear. Dan is not messing around. Um, let’s just slide out of the ring and write a few more listings, then maybe get back into it, shall we? Aftermath (Syfy, 10 p.m.): Anne Heche stars in this apocalyptic thriller show, in which a family deals with every world-ending threat imaginable, including plague, meteors, earthquakes, storms, and supernatural creatures, because why not just throw them into the mix? This is presumably for those who feel the characters on The Walking Dead have things a bit too easy. Alex McCown-Levy has a more developed take in his pre-air review. Drunk History (Comedy Central, 10:30 p.m.): Television’s foremost historical documentary series—and honestly, given the decade-long disintegration of the once mighty History Channel, we’re not even sure that’s a joke—returns for its fourth season. Tonight’s premiere features LSD pioneer Timothy Leary, an escape from Devil’s Island, and a baker on the Titanic. Star Plates (Food, 11 p.m.): Celebrities get to team up and with and learn from their favorite chefs, in culture’s latest reminder that celebrities are better and more fortunate than you, so why even bother sometimes, you know? Anyway, Mindy Kaling stars in the premiere alongside Marcus Samuelsson of Harlem’s Red Rooster, who shows her how cook the Fried Chicken Royale. This… this is not going as well as we had anticipated. We now understand why they call Dan the American Badass. Better start making peace with the inevitable, we guess. “Are You Better Off?”, Parks And Recreation (Netflix): Some stupid idiot made this the top pick on his very first What’s On Tonight, and then that same stupid idiot ended up reviewing the following two seasons. Seems an appropriate way to close things out here, then, even if we realize posing that episode’s titular question to you all—“Are you better off?”—would likely provoke a range of responses from “Uh, we’re just here for the Jeopardy! recaps” to “Only if being better off entails watching way too many stupid wrestling videos.” Which, speaking of, let’s finish this. Dan, have fun with this ridiculous, wonderful thing. And now, we’re ready.